Food history is such an important part of story telling. We’ll talk about that again and again at the conference – what is your story? Fortunately for us, this Friday night at the TASTE OF SACRAMENTO CULINARY FAIR, we are being joined by Jimboy’s Tacos – a Sacramento original! They’re parking the truck close by and delivering fresh, authentic Mexican NoCal food to us. THANK YOU, Jimboy’s! Read their beautiful story here…..
A Sacramento tradition for over 62 years, Jimboy’s Tacos debuted in a small trailer on Kings Beach in Lake Tahoe, California in 1954. 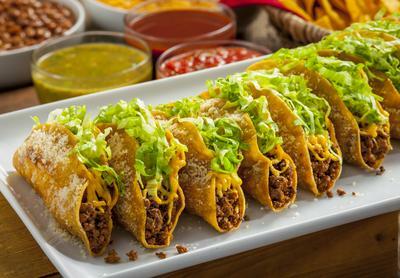 Founded by Jim “Jimboy” Knudson, it started with Jim’s recipe for his signature flagrantly spiced ground beef taco, encased inside a grilled stone ground corn tortilla with some crisp lettuce and freshly shredded cheese, and dusted with a liberal coating of grated parmesan cheese. Knudson was a pioneer in many respects – it’s hard to believe now, but when Jim first began selling his tacos from a trailer in the mid 1950’s, not many had ever heard of the “taco.” In fact, Jim had to spell it out phonetically on the trailer so people could pronounce it. In addition, there weren’t many people using food trucks at that time to sell food, and that proved to be a novelty for customers as well. After a few years, traffic began to pick up, fueled in large part by positive word of mouth from locals in the area. 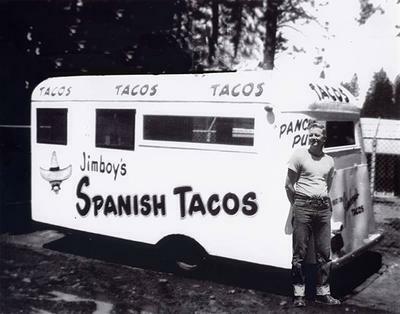 In the spring of 1958, Joe King, owner of King’s Beach and a huge fan of Jimboy’s Tacos, built a small building on North Tahoe Boulevard for the sole purpose of giving Jimboy’s a more permanent home. Celebrities performing in the famous CalNeva Lodge in Tahoe, including members of the famous “Rat Pack,” Dean Martin, Joey Bishop and Peter Lawford, began hearing about Jimboy’s Tacos and making trips to the storefront. All three stars from “Bonanza” – Lorne Greene, Dan Blocker and Michael Landon, were also fans of Jimboy’s Tacos. In fact, they would often send someone to order tacos for the cast and crew when they were filming in the area. Countless other stars of the 60’s and 70’s began discovering Jimboy’s Tacos at the same time. In 1969, Knudson’s pioneering spirit kicked in again. At a time when not many restaurants had not yet begun franchising, Knudson franchised Jimboy’s Tacos in the Sacramento area. The Jimboy’s Tacos phenomenon has since grown to over 40 locations throughout California, Nevada and Texas. Jimboy’s Tacos has built a large and loyal following of fans because the commitment to using fresh, quality ingredients has never changed. From the very beginning, Jimboy’s Tacos focused on freshness and quality, using only fresh, premium ingredients, preparing food from scratch daily, and cooking in small batches to ensure freshness. Since 1954, that fresh quality food philosophy has never changed. Be sure to visit Jimboy’s Tacos at the Taste of Sacramento Culinary Fair and sample The Original American Taco – Jimboy’s Ground Beef Taco.